Open world games often struggle to find balance between two extremes – the ability to craft a custom experience, and a linear progression that provides satisfying narrative. Shadow of Mordor explores a unique solution to the dilemma, offering an unfolding story that reacts to the player’s choices. It’s a fascinating experiment in emergent action on a grand scale, but the focus on those emergent elements can lead to frustration in the early game, and too much repetition later on. Shadow of Mordor earns its Mature rating in the first few minutes, with a horrific but gripping scene that fuels the many hours of gameplay that lie ahead. The ranger Talion is united in death with a mysterious and ancient wraith, and their combined powers and lust for vengeance are enough to pose a threat to Sauron’s emerging armies during the years between The Hobbit and The Lord of the Rings. The storytelling is one-note (revenge! ), and it’s delivered through melodramatic dialogue that is a precise match to Tolkien’s declamatory style. The commitment to Tolkien lore is admirable and extensive. Both the main story and side quests are filled with allusions to the broader fiction, and it’s wonderful to see Monolith dig so deeply into the established lore. Whether by collecting artifacts from the lost ages of Middle-earth, or sneaking through the dreaded fortress of Durthang, a sense of place and history pervades the journey. 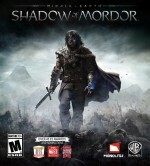 Mordor’s craggy peaks and grassy plains are filled with secrets to uncover, many of which provide a deeper understanding of Talion or the wraith, and their connection to the classic story. Even with the close ties to the characters and events of Tolkien, Shadow of Mordor is tonally dissonant from its source material. Unlike that ultimately optimistic set of tales, this revenge-fueled ride is a bleak take on the universe. Many may be disturbed by the dark and oppressive imagery on display. Shadow of Mordor’s most fascinating feature is its nemesis system, in which many missions and conflicts arise from earlier combats and deaths. An army of named Uruk soldiers patrols beyond the Black Gate, each one vying to rise through the ranks and grasp greater power. Die in battle, and your slayer may be promoted and recall that early battle upon your next meeting. Horribly burn a foe and let him escape, and he screams for a rematch if he catches sight of you again. Dominate a puppet and turn him to your cause, and opportunities arise to move him up to warchief status. Many of these encounters happen naturally as you explore, but an equal number show up as new missions on the map. The dynamic makes for a remarkably engaging and custom experience. However, the system can get carried away into overdrive, with multiple named enemies converging on one location in a single mission, making it easy to get into fights that you are ill-equipped to understand or complete. If the metagame is all about the ever-shifting conflicts of Mordor’s war machine, the gears that turn that machine are the constant battles Talion faces along the way. Whether in stealth, at range with his elven bow, or in furious melee, the fights are challenging and engaging. Combat carries a visceral punch, and is perversely satisfying with its brutal decapitations and revenge-fueled executions. Rhythmic inputs allow for a surprising array of moves, and button mashing is a sure recipe for failure. Mastering the system demands attention to all your enemies, changing up your maneuvers, and recognizing moments for a strategic retreat. The melees are impressive and dangerous, but the power of combat’s punch is blunted by repetition. Many open world games (including chief inspirations Batman: Arkham City and Assassin’s Creed) offer palate-cleanser side content that changes up the player’s focus. In Shadow of Mordor, whether completing story missions or side missions, the focus is all killing all the time. By the end of the lengthy campaign, the battles don’t carry the same thrill. Mordor’s strongholds and open fields often play host to massive and often overwhelming conflicts. It’s not unusual to end up in a fight with dozens of foes at once, and blaring alarms bring more all the time without careful work to contain the disaster. Named enemies each have an array of weaknesses and immunities, and keeping them straight in the midst of a fight is difficult. Battles can stretch for many minutes, and just a few mistakes lead to a grisly end. Later, things get even more confusing as you recruit your own soldiers, but the game does little to distinguish friend from foe. Players who refuse to engage with the tactical option of taking out bodyguards first and targeting enemy weaknesses are likely to find themselves overwhelmed. Even when doing everything right, moments of genuine frustration threaten to halt the fun. I have nothing but praise for Talion’s progression and upgrade mechanics. New powers offer meaningful and game-changing abilities that unlock gradually throughout the campaign. Confront tougher enemies, and you’re rewarded with better runes to improve your weapons. Perhaps most importantly, all activities contribute to progression in some way, providing incentive for exploration. The final hour of Monolith’s Middle-earth adventure falls flat, as the story falteringly tries to pull together a number of disparate threads, and the mostly triumphant nemesis system fails to stick the landing. Even with these and other features that rubbed me the wrong way, I can’t help but cheer for Monolith’s ambition. Shadow of Mordor is an unabashedly challenging and complex experience, sometimes at the expense of accessibility. I’m thrilled that we’ve got a new franchise in the fertile ground of Tolkien’s fiction. Add in a borderline revolutionary approach to mission design, and this is a firm foundation for a stellar new series. Monolith's take on The Lord of The Rings fiction is a dark and brutal adventure shaped by player actions.